The brakes on your vehicle are an essential component because they’re the most basic safety feature. They’re responsible for you limiting your speed, and of course stopping to prevent a collision. However, your brakes and their components go through wear and can get affected from various elements, which is why it’s important to have them inspected regularly and repaired when you can sense that something’s amiss. At Elite Acura, we’re here to let drivers like you in Maple Shade, Moorestown, and Cherry Hill know about the ways that you can tell it’s time to start search for a brake repair near me. Brake Pads: these components create friction to help you reduce your speed by pressing against the rotors to slow the movement of the wheels. These important components are generally the most commonly replaced part of your vehicle’s braking system, so having them checked regularly is important. Brake Calipers: these clamps are responsible for forcing the pads against the rotors when you are pressing the brake pedal. Brake Fluid: brake fluid is crucial to the system because it flows through the lines to help push the calipers and pads against the rotors when you apply pressure to the brake pedal. Rotors: these components are attached to the wheel and help slow down movement of the wheels because the calipers are forcing the pads against them. While it’s important to have your braking system checked regularly for any signs of wear or premature damage, you can also detect these issues yourself. There are several signs that you can look out for that will tell you it’s time to schedule brake repair near you to help correct the issues so you can relax knowing that you’ll have full function of your braking system. Grinding & Squeaking Noises: you’ll hear this sound when your brake pads are starting to go. Brake pads are equipped with metal pieces called wear indicators. When you press the brakes and hear this loud pitch, it’s the metal part letting you know that you’ll want to change your brake pads soon. There’s Vibration When You’re Pressing the Brake Pedal: this sign usually indicates a worn rotor. Brake Dashboard Light: this light will pop on when the system detects an issues with your braking system, whether it’s low fluid or a broken component. Spongey Brake Pedal: when you press on the brake pedal and feel little to no resistance, it could mean that you have air in your brake lines. Have this issue corrected as soon as possible because it has a major effect on the function of your brakes. If you notice any of the signs listed above, you don’t want to wait it out. You should immediately schedule a repair with a brake specialist near you because driving around without the full function of brakes is not only harmful for your vehicle, but it is also dangerous. 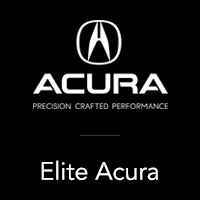 Drivers in Maple Shade, Moorestown, and Cherry Hill can always contact us at Elite Acura for brake repair. 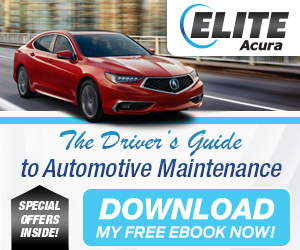 Schedule your brake repair today at Elite Acura!